Sara is a teenage girl who awakens to find herself trapped on an emerging revolution, now she must choose between love and war. GENRE: Adventure romance and Post-Apocalyptic short story you will surely enjoy. Mi Nombre es Sara G y Sobrevivi. Now you can Learn Spanish with short stories specially designed to help learn Spanish reading using vocabulary that you can actually use every day, This short novel is written in easy spanish because it is not as complex as some books written to win literature contests. This will make it easier to understand Spanish. So stop wasting time in any reading old books with phrases that are either difficult to understand or unlikely to ever find good use for, as you may be aware of, are found in much of the Spanish old literature. Aimed for people who want to learn Spanish by reading, this book will help you improve comprehension and familiarize yourself with unique expressions in Spanish. 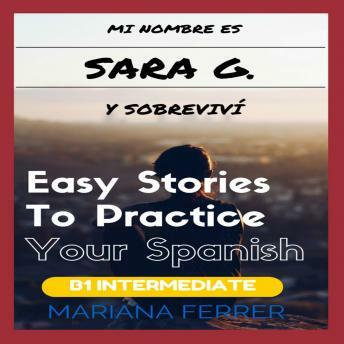 Written by a real spanish writer, Mi Nombre Es Sara is a story that introduces new vocabulary and it is easy to follow. It makes easy to practice all of the tenses and moods in Spanish. freshens up your Spanish. High frequency vocabulary and structures. Start now to Learn Spanish with Stories!